These days any time I have an encounter where I don’t receive crappy customer service I celebrate. Anyone I talk to generally agrees with this. Before entering teaching I worked in a software company, often supporting clients with questions or issues with our product. They would sometimes call feeling angry, frustrated and looking for someone’s head to rip off. Even though the problem was generally something they did, I always made sure to treat them with respect, absorb the negativity, and channel it into a solution. I never engaged in arguments or accusations, and I always made sure that if I said I was going to get something done for them I did, and right away. After all it wasn’t my reputation on the line but that of the company I worked for. But this attitude in customer service seems to be almost extinct. Take Rogers for example (if you’re not from Eastern Canada, that’s one of the big telecommunications companies we have little choice but to deal with in these parts). Any time there is any issue we have to call about, my wife and I end up putting it off because we know, from experience, that it will be at least an hour on the phone, after which whatever we thought we had settled on would be incorrectly implemented and billed, so that upon receiving the next statement we would have another minimum one hour phone call to make. So in the face of this dearth of good customer service, I decided to write today about a few extremely positive experiences I have had. People should definitely know about these, and hopefully bring their business to these companies. I also encourage you to share your own examples of excellent customer service in the comments. I’d love to read about them and reward them with my business when possible. “Nonsense. They just need to be cleaned.” and then proceeded to clean them for me. Took him about 20 minutes. He charged me nothing. The man could have easily made a $120 sale and I would have been happy. He would not have lost my business because I love that place. I never would have known I’d wasted my money, but he would have. So that’s what he did. What I did was turn around and buy a $100 barbecue cover that I didn’t really intend to buy, because I wanted him to make some money from me that day. Longo’s is a chain of grocery stores in my area. I don’t know how far out of the Greater Toronto Area they have stores, but if you have one near you, shop there. Longo’s has one of those loyalty programs that everyone seems to have these days. At the beginning, you could redeem earned points for merchandise from their website. 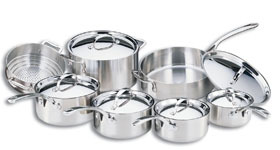 My wife and I needed a new cookware set and they had one on their site that we really liked. Lagostina set, retails for about $320. Lagostina cookware set. Currently $320 at The Bay. So we were saving our points for that. Then one day when I was cashing out at Longo’s the cashier told me that they were phasing out their merchandise rewards in favour of cash rewards in the store. I was sad about that, because we were still about 3000 points short for the set and we really wanted it. To earn 3000 points we’d need to spend another $1500 in groceries in a few weeks, which was obviously not going to happen. I emailed Longo’s and asked if there was any way to pay the difference between the points we had earned thus far and what we needed for the cookware set. If they had given me a dollar amount I needed to pay I would have been very happy with the service. Instead they immediately credited my points account with the 3000 extra points I needed (at no charge), and I ordered the set (it’s awesome, by the way). This was far beyond anything I had expected them to do, even in the best case. I have an iPhone 5 that I use intensely. I find that the battery life for me is only good for about 2/3 of a day. I decided I wanted a battery case for the phone and Mophie cases are a great (but expensive) choice. I had a case that I liked, the juice pack helium, but it only added about 80% more battery life to the phone and after about a year I decided to upgrade to the case that adds 120%. It’s the juice pack plus. 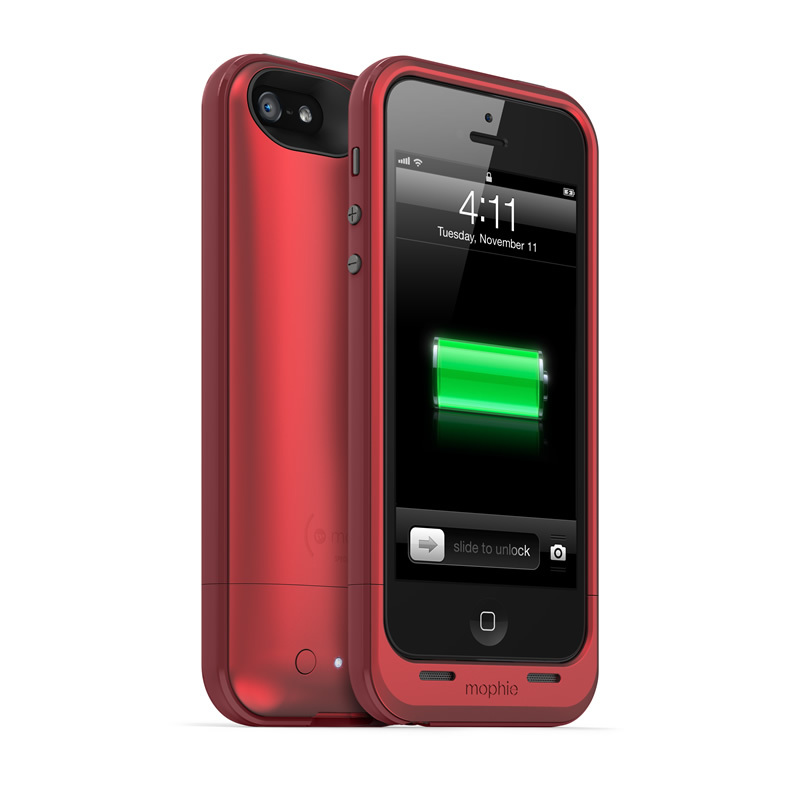 That case also comes in red (part of the (Red) campaign), but it’s a little extra. For my birthday my brother and some good friends chipped in and bought me that case. With tax that’s about $150, which was certainly very nice of them. After a couple of months I started to suspect that there was something wrong with the battery in the case. It’s hard to be sure, but it seemed to me that I was consistently getting less battery life with the new case than I was with the old one, which makes no sense. The old one would take me from 20% battery to full charge and then some. The new case would often only get me to around 95%. I contacted Mophie through their website and explained the potential problem. Their response came the next morning, asking me to submit the serial number of the case and a scanned receipt. I responded telling them I had no receipt because it was a gift, but of course I did have the serial number. The next morning their response to that was to confirm my shipping address and they shipped me a new case, indicating that it was not necessary for me to return the old one. Wow. I received the new case 3 days later. When I plugged it in to charge it charged, but when I connected it to my phone the phone did not charge immediately, though it eventually did. I emailed them to let them know about that and their response was once again immediate. They shipped me another new one – no need to return the old one. In both cases I would have fully expected to have to return the old case, and not seen that as a problem. I received the second new one 3 days later. I posted about this excellent service on Facebook but the story doesn’t end there. A few days after receiving the second case I got an invoice from FedEx for customs charges for the first case. The phone cases were shipped from Michigan and I guess when they go through customs FedEx covers any charges at the border then bills the recipient. I figured I’d get a second bill from FedEx for the second case, which I did. Once I had both bills I contacted Mophie and without any argument (in fact, with an apology!) they asked me to send they scanned copies of the invoices so that they could pay them. There you have it. These are three examples of beyond excellent customer service I have received. The sad part is that it’s the only three examples I can think of, but I know you have more. Please share your good ones in the comments section, so that more people can know about them, and please give your business to the three I’ve listed!